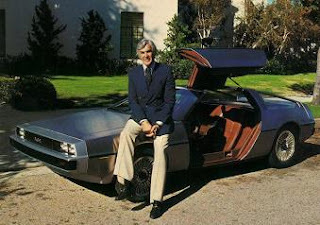 John Zachary DeLorean (January 6, 1925 – March 19, 2005) was an American engineer and executive in the U.S. automobile industry, most notably with General Motors, and founder of the DeLorean Motor Company. He was best known for developing the Pontiac GTO muscle car, the Pontiac Firebird, Pontiac Grand Prix, and the DeLorean DMC-12 sports car, which was later featured in the 1985 film Back to the Future, and for his high profile 1982 arrest on charges of drug trafficking. The alleged drug trafficking was supposedly an attempt to raise funds for his struggling company, which declared bankruptcy that same year. He successfully defended himself against the drug trafficking charges, showing that his alleged involvement was a result of entrapment by federal agents.